Edgar P. Harney Spirit of Excellence Academy. 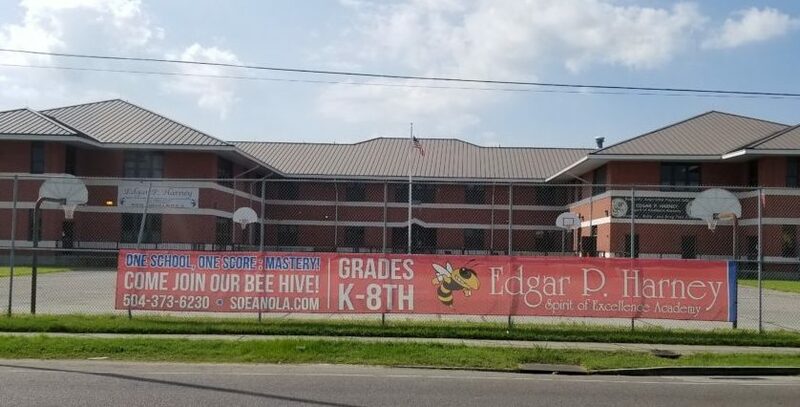 Orleans Parish schools Superintendent Henderson Lewis Jr. will seek to revoke Edgar P. Harney Spirit of Excellence Academy’s charter mid-year after financial mismanagement and leadership instability, he told Orleans Parish School Board committee members at a Tuesday meeting. Last week, Lewis told families the district would not renew the school’s charter and it would close at the end of the school year due to several areas of concern, including special education shortcomings, “high-risk” contracts and failure to comply with state law and district policy. Lewis said the district referred some of its findings to the Orleans Parish District Attorney’s Office, suggesting that Harney’s board — which is led by the Rev. Charles Southall III and also includes former First NBC Bank CEO Ashton Ryan — may face a criminal investigation. The charter responded by expanding its legal team. Lewis said his office would send a revocation letter to the Central City charter school’s governing board immediately. He again called for the board to surrender the school, which had 250 students enrolled as of September. “I will ask the leadership of Harney once again to turn the school over to us,” Lewis said, noting that would speed up the process. If Harney’s board refuses, the district could take the school over through revocation proceedings as soon as January. Lewis said the district would run Harney if the revocation is successful. “We will directly operate the school for the remainder of the school year,” Lewis said. Last year, the district began the charter revocation process at two Einstein Charter Schools after the Einstein charter network refused to provide bus service to elementary students. The district and Einstein disagreed on what it meant to provide student transportation as required in the schools’ contracts. The district sued Einstein last fall, prior to beginning the revocation process, but Einstein ultimately moved to hire a bus company. Candice Forest, the district’s deputy general counsel, said that after formal notice goes out today, parents and staff must be notified by Dec. 5. She said the district will work to notify them earlier than that. Following that, the district will hold a pre-revocation meeting at the school. At December’s Orleans Parish School Board meeting, Lewis will present a revocation recommendation and, so long as the school board doesn’t override his recommendation with a two-thirds vote, the revocation could be finalized in January. Then the district would run the school directly. OPSB member Leslie Ellison asked about Harney students. “Have the parents been given an opportunity to relocate their child to another school?” she asked. Aiken said the district will grant “hardship transfers” for Harney students. Typically, the district does not allow students to transfer schools after Oct. 1, unless it is for what they call a “hardship” reason. That can include special education needs, safety, and a handful of other reasons. She said roughly a dozen had been granted so far. “Due to the severe nature of the situation, we are granting [hardship transfers] right now at Harney,” Aiken said. Southall, Harney’s board president, did not immediately respond to a call for comment. Board member Ben Kleban, who represents Harney’s district, told Lewis he supported his decision. “Unfortunately, the charter board has left us with no choice,” Kleban said. Kleban also wanted the district to assess its ability to run schools in emergency situations. “This is the third surprise closure or revocation in the last six months,” he said. Lewis announced his intention to close Cypress Academy this week. The school had been taken over by the district in May after its former charter board made the surprise decision to close due to financial problems. And last month, Crescent Leadership Academy, the city’s only alternative program that served middle school students, abruptly closed. “I continue to be concerned about the district’s capacity to be able to respond to surprise circumstances,” Kleban said. Chief Operating Officer Eric Seling on Tuesday said that Cypress Academy is running a deficit of $885,751. Seling said that was due to under enrollment and employee benefits. Kleban asked district administrators to present a full analysis at next month’s budget committee meeting of how much it would cost to run Harney. The school district is leaving portable toilets on campus as a precaution.